As a full-service Ohio grounds management company, Schill Grounds Management provides award-winning professional landscape management services to commercial, industrial, retail, medical, apartment and condominium properties throughout Cleveland and Northeast Ohio. With our large professional staff, modern, energy-efficient equipment, and three facilities across the greater Cleveland area, we can handle every landscaping and grounds management need, starting at the beginning of the season with a landscaping spring clean up. We are committed to sustainable business practices and using earth-friendly products and equipment. 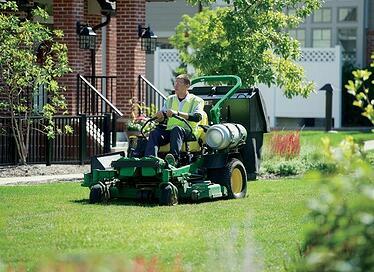 We have a fleet of 100 propane powered lawn mowers that allow us to reduce our emissions by up to 70% compared to conventional gasoline, and we use organic fertilizers to keep your plants looking their best while minimizing our impact on the environment. We work closely with you to find ways to improve your property and make the best first impression for your clients, customers, employees, residents, or guests. Through proactive solutions like our customer feedback form, our quality audit system, and scheduled service visits, we are able to recognize potential issues with your property and address them before they become costly problems. Can we help you with any of these Grounds Management and Landscaping Services? If so, please get in touch with us today!